- Put yarn to back of work, slip as if to purl next 5 sts to RH needle dropping extra wraps. (Put yarn to front of work, slip them back to LH needle. Put yarn to back of work, slip again to LH needle) twice. Knitted in a multiple of 6 sts + 1. Row 1 - Wrong side: Knit 1, * (knit the next stitch wrapping the yarn 3 times around the needle) 5 times, knit 1; repeat from * to end. 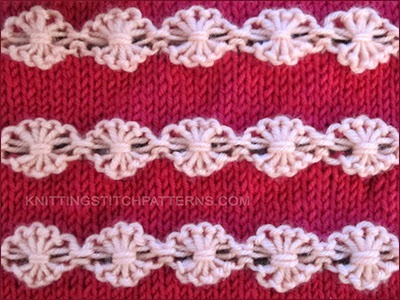 Row 2 - Right side: Purl 1, * flower stitch, purl 1; repeat from * to end. Row 3 - Wrong side: Knit all sts. Row 2: Knit 1, * (knit the next stitch wrapping the yarn 3 times around the needle) 5 times, knit 1; repeat from * to end. Row 3: Purl 1, * flower stitch, purl 1; repeat from * to end. Row 4: Knit all sts. Repeat PATTERN until you have reached your desired length.